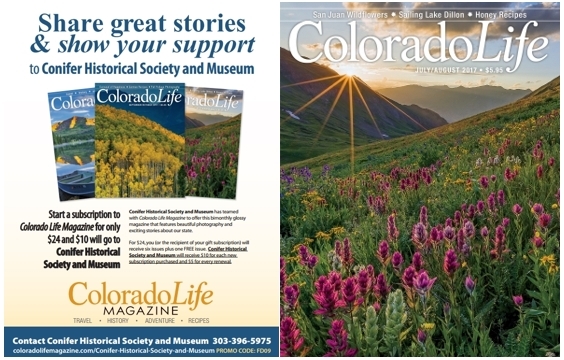 Here’s an easy way to support the Conifer Historical Society: A subscription to Colorado Life Magazine! Get one for yourself, or give one as a Gift. A one year subscription (6 issues + 1 Bonus Issue for support CHSM!) is only $24.00 and Colorado Life will donate $10 to CHSM for every new subscription and $5 for every renewal! You may renew securely online HERE (https://tinyurl.com/chsm-colife-mag) – Just be sure to enter Coupon Code FD09 at check out so they know you are part of our group! If you prefer to mail in your subscription, simply print & fill out the form below. Mail it along with your payment choice (Cash, Check, or Bill Me Later) to us at: CHSM, PO Box 295, Conifer, CO 80433. Please make checks payable to Colorado Life. Paper subscription forms must come to us first in order for CHSM to receive the donation!